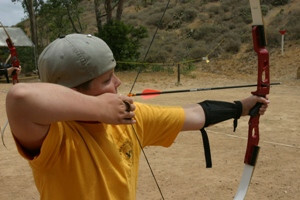 Camp Emerald Bay currently serves over 4500 Boy Scout Campers per summer. With such a large propery and many exploration sites on Catalina’s West End, the possiblities for activity and growth are limitless. Your week-long stay will be broken into five periods each day, during which you may take part in a number of merit badges and rank advancement opportunities. 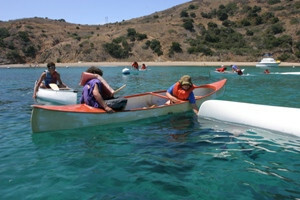 Emerald Bay also offers a wide variety of Troop bonding activities such as kayaking, mountain biking, and snorkeling. You will also take part in the traditional Emerald Bay War Canoe, where you will join your troop for an incredible team building overnight experience on secluded Parson’s Beach, just an hour’s canoe ride away. In addition to the many merit badge programs detailed in the 2016 merit badge packet (available in the Spring of 2016) and numerous troop activities, Camp Emerald Bay has a number of programs to offer you during your free time during the rest of the day. Be prepared: One thing you can truly count on is keeping very busy during your week long stay here. The following is a list of our various program areas, as well as a few additional programs you can sign up for while at camp. • Waterfront: Come down to Doctor’s Cove to snorkel with a buddy and you might spot a Giant Black Sea Bass or Bat Ray! • Handicraft: Join our creative Handicraft staff during an open session and sculpt a masterpiece, stamp a leather belt, or carve an original neckerchief slide. Purchase your item at the Ship’s Store across the way and we’ll show you how to make it your own. • Nature: Meet with our Nature Staff on the Dining Hall Porch after dark and learn about the stars like you never could in a planetarium. The plethora of shining stars in our sky isn’t veiled by city light or air pollution. Who knows? You may just catch a meteor shower while you’re gazing. • Marine Center:Explore the aquarium. See and touch a live Leopard Shark! • Field Sports: Looking to improve your skills as a marksman? Come on over to our state-of-the-art Archery, Rifle, and Shotgun ranges for some free-shooting time. • Scoutcraft: When you come up to our Scoutcraft pirate ship during your free time, let loose and play some volleyball on a net that you wove together, or contribute your own structural masterpeice to the area for future Scouts to enjoy! • Aquacade: Try Aqua-madness! Head to the waterfront for fun with your troop and compete in our camp-wide games. Help your troop win the coveted Aquacade trophy! • Silver Peak Sunrise Hike: See the sunrise like you never will again. The West End of Catalina is home to the third largest peak on the Island. This four-hour round trip hike is not for the faint of heart, but your toils will be rewarded with a stunning 360 degree sunrise panorama. • Pirate Award Program: Have you been to Emerald Bay before? Are you coming back this summer? If so, download this form to check out the requirements of our exclusive Pirate Award Program. Complete the requirements during your free time and earn a cool patch to put on your uniform! 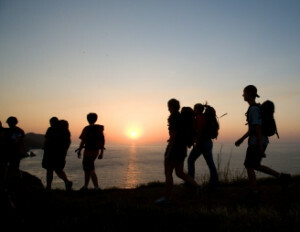 Top Left: A patrol of boys hikes to Arrow Point to watch the sunset over the Pacific Ocean. Middle Right: Scouts practice a cross-canoe rescue on the Waterfront. Bottom Left: A Scout aims for a bull’s eye on the Archery Range. We are introducing a new program for Webelos, Cub Scouts and their parents to attend Camp Emerald Bay during our summer season. This four day-three night adventure will have your Scouts traveling to Camp Emerald Bay on Sunday with the incoming Boy Scouts. They will do their swim test, get their campsite and get ready for fun in the sun while participating in specialized programs just for them. They will have an opportunity to earn advancements, shoot archery and BB guns, and take part in waterfront activities at one of the nation’s finest summer camp locations. The Cub Scouts and Webelos will be camping in their own campsites, sleeping in traditional Boy Scout tents, they will fall asleep to the gentle ocean breeze every night. This is a perfect event for a Cub Scout and their parent, a Webelos, or an Arrow of Light Scouts. The Arrow of Light Scouts will get a taste of what’s in store for them in the future when they cross the bridge into Boy Scouts. 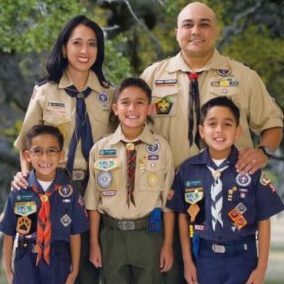 For Cub Scouts and Webelos they will have a chance to earn advancements and be that much closer to their journey over the bridge to Boy Scouts.